1 In a 3-litre saucepan, fry the onion in the oil on a medium heat for 2 minutes. Add the chicken and stir for a minute, then add the garlic, if using. 2 Boil the kettle. 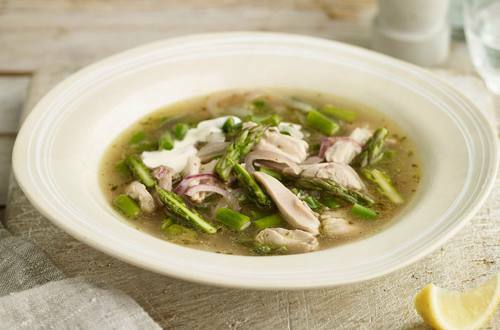 Measure out 900ml of boiling water in a measuring jug, then crumble in the Knorr Chicken Stock Cube and stir to make a stock. Pour it into the pan. 3 Snap the ends off the asparagus and discard. Cut off the delicate tops (about 3cm of the spear) and halve lengthways. Set aside. Slice the stems and add to the pan. Stir well. 4 Add the beans, then simmer for 7 minutes, adding the asparagus tops towards the end of the cooking time. 5 Stir in the Mixed Herbs Flavour Pot, remove from the heat and squeeze in the lemon juice. 6 Enjoy with a spoonful of crème fraîche and bread on the side.